Somehow unexpectedly, at least three students (that I know of) are now in the process of writing their Master Thesis about the digital communication of the European Union pavilion at Expo Milano 2015. Why do I say unexpectedly? Because, it is a very specific project which requires a lot of research behind the scenes. But hey, it was a very successful project both in terms of numbers and innovation and a totally disruptive communication idea for a European Union institution. As flattering as this was, being interviewed by students on the work I do has been incredibly enlightening. I got literally “therapized” by one of these students who I recently met. Apart from being absolutely sure that this girl will go places, I was utterly impressed with her level of attention to details, analysis and the ability of choosing the very right questions. Finding out that someone has read each and every post you wrote (and I mean this literally) puts you under pressure. It was something in between an interview and a parliamentary hearing, especially when you are asked to justify things you haven’t actually paid much attention to. Whenever you get an external view on your work you capture some things you normally wouldn’t in your own mindset. Or perhaps you wouldn’t have the courage to admit to yourself. I have recently experienced some big changes and I see every day how this affects my work, my thoughts and my life. We all need, every now and then, to change our mindset and do something out of the ordinary or we end up getting stuck in a rut and kill our creativity. Flexibility and the desire to create beautiful things is the bread and butter of what we do and it is very hard to keep this desire alive when things get “too comfy.” Stability can be your worst enemy if it doesn’t bring new challenges. We have got to be open to criticism and think that not all we do is perfect and accept good advice from those who demonstrate, with their actions, that they deserve our attention and professional respect. “This Expo is for those who take it… it’s up to you what you make of it.” This is what I remember most from my conversations with the other communication managers taking part in this year’s Expo – an unprecedented event which I believe truly changed Italy. And in terms of EU digital communication, I think we really did make the most of it. The EU had the most engaging social media presence in the whole Expo, and, for me, it clearly shows that it is possible to make Europe appealing if we humanise our communication and target ‘real citizens’. This is how we tried to do just that. The first thing we did to change the communication mindset was to get some new running shoes. Yes, for real. Effective community management can no longer be done sitting in front of your computer. 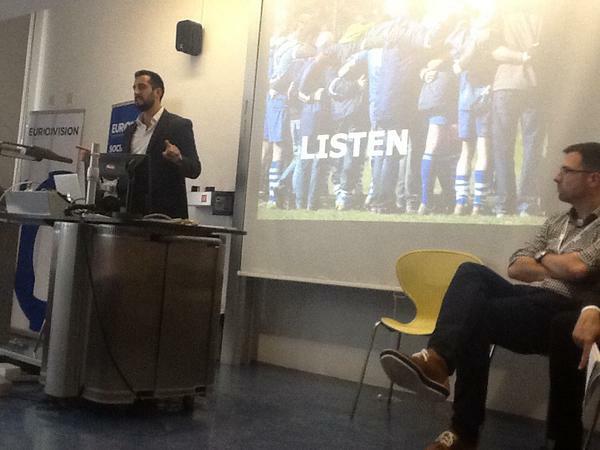 The more we digitalise our relations, the more human relations matter in community building. So, I needed to get out, to meet people, and to talk to communication professionals from all over the world, in order to seize the historic moment of the first real socialmedia World Expo. Second, we explored how people around the world did communication – and it turns out that it’s not all about likes, retweets and followers but actually about making real human connections with those influencers, stakeholders and participants that can make your message travel further. A cup of coffee is far stronger than a retweet when developing communication networks. (For the record, the EU did pretty well when it came to the figures, too – our Facebook page had 51 500 followers, the Twitter account more than 18 000, Instagram over 5 000, while the website had more than 250 000 visitors). Third, we focused on communicating Europe to citizens. “You’re crazy if you want to do this at a World Expo,” I was told – but thousands of social media users clearly disagreed. Expo brought the world to Milan and we brought Europe to the world with a simple message – ‘We are stronger together’. We did it by merging digital communication and personal connections. Could this be the way ahead, the way to most effectively bridge the gap between citizens and policymakers? The time is ripe and we certainly have the tools – and the experience – to do it. So why not call me for coffee and we’ll talk about it. The scientific program of the European Union at Expo Milano 2015 is one of the “best practice” selected at the international level. This is the reason why the European Union has received the “Euromediterraneo2015” prize from Confindustria Assafrica & Mediterraneo and Associazione Italiana della Comunicazione Pubblica e Istituzionale (Italian association of public and institutional communication). The “Euromediterraneo” is one of the most prestigious prizes in Italy in the realm of public communication at the national level. The European Union has been awarded in the 2015 edition titled “Next Europe, Next Med, Next Communication Tools” because the scientific debate has been recognised as one of the most important content of Expo Milano 2015. “Since the beginning of this Expo – said David Wilkinson, Commissioner General for the EU Participation at Expo – the promotion of the European Union policies has been a real challenge. We have counted mostly on our scientific contents, trying to encourage a concrete discussion around the scientific community. It is an honour for us to receive such award. Our commitment has been recognized. The scientific committee is now working to collect all the information and considerations gathered throughout the duration of Expo. Next 15 October our Steering Committee will present some recommendations to the European Union institutions”. In questo nostro viaggio sul giornalismo ai tempi dei social, non poteva mancare una puntata dedicata a uno degli eventi, anzi l’Evento, che più deve fare i conti con la comunicazione: e cioè Expo 2105. Senti, ti interrompo un attimo e approfitto del tuo particolare osservatorio. Come sta andando Expo 2015? Bene, tornando al tuo ruolo dicevi che ti occupi di gestire la comunicazione digitale del Padiglione europeo. E che lo fai come Community manager. Perché questo ruolo è così importante? Perché ormai la comunicazione digitale non utilizza più i social come mezzi di trasmissione e di informazioni già pubblicate, Non fa cioè broadcasting, ma vuole creare e consolidare una”comunità di utenti”. Nel nostro caso una comunità interessata a ciò che l’Unione europea fa a proposito dei temi di Expo, su tutto ciò quindi che implica la nutrizione del pianeta”. Okay. Banalizzando per i non addetti, tu a Expo sei il raccordo tra Unione europea e tutti coloro che sono interessati alle sue iniziative sulla nutrizione del Pianeta. Va bene, ma prova a spiegarci come lavori. Se hai una notizia fresca che dal Padiglione Europeo vuoi far arrivare a tutti, cosa fai? Ogni Social ha suo pubblico? “Sì, certo, e il pubblico viene chiamato appunto comunità. Su Facebook è molto importante l’aspetto visivo. Un post su Facebook senza una bella foto non raggiunge tutta la comunità. Bene, tante opportunità. Quali sono invece gli svantaggi lavorando sui social? “In realtà, io ci trovo solo dei vantaggi. Gli elementi negativi sono così pochi che spesso vengono messi sotto il tappeto. Lo svantaggio maggiore è soprattutto la scarsa controllabilità dei social. Noi abbiamo una nostra hashtag che però non ci difende da una eventuale valanga di twitter mirati a bloccare il tuo canale d’informazione. Qui siamo ancora vulnerabili, ma ci stiamo attrezzando rapidamente”. Ultima cosa: qui parliamo spesso di come i social stanno cambiando il giornalismo, tu che sei in prima linea cosa ne pensi? Penso che tutti gli operatori dell’informazione devono adattarsi. Si andrà sempre più a digitalizzare a e velocizzare la nostra informazione: e soprattutto gli utenti saranno sempre più esigenti nel riceverla. Una informazione rapida, digitale e condivisibile in tempo reale. Questa è una esigenza più del pubblico che del fornitore di informazione, ma solo i fornitori che si adatteranno possono sopravvivere al cambiamento. La sfida è soprattutto a livello televisivo. Giornali on line e radio hanno fatto grandi passi avanti. Ma a livello televisivo si può fare di più integrando la dimensione social con quella televisiva per raccogliere in maniera efficace il cosiddetto feed back. Molte televisioni sportive sono già avanti, avendo anche la possibilità di raccogliere le sollecitazioni di un pubblico molto passionale. Per l’informazione molto bravi sono anche i colleghi di Al Jazeera che offrono un ottimo esempio al riguardo: nell’integrazione cioè tra social e tv. Il riscontro con l’utente è un tesoro per il giornalista e soprattutto per il conduttore televisivo”. The Russian pavilion at Expo 2015 Milano is pretty amazing in terms of what it offers to visitors. A great design, beautiful shows that open up your eyes towards the tradition, the heritage and the prospects of the country and, last but not least, the best, most active and dynamic communication team of this unique World Expo. During their mascotte tour , a lovely bear named Mishka (who’s having tremendous success in Expo), around the pavilions of Expo, I was given the chance to explain in a nutshell what is the main message the European Union is trying to convey to the millions of visitors that have spilled over the Expo site, but also to those who can’t make it to Milan. To grant a sustainable future in terms of food and nutrition, it is necessary to combine tradition and science in a way that guarantees the respect for the earth for ourselves. Access to food will be available to all only if we collaborate. The story of “The Golden Ear” answers the question: is it possible to obtain food security through good cooperation not only among countries but also between science and agriculture, and between innovation and tradition? In fact, the protagonists are a researcher and a farmer: two neighbours who are quite different, a metaphor of the European Union’s motto: unity in diversity. Great thanks to the colleagues of the Russian pavilion and to Maria Yudina for conducting the interview. 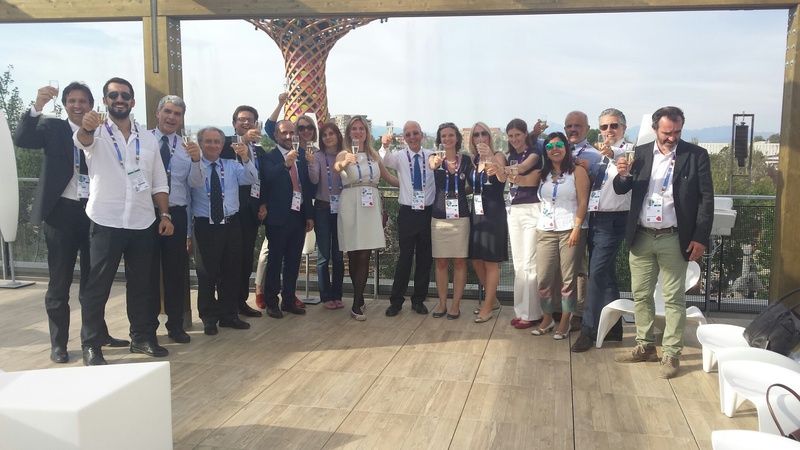 The Social Media Team of Expo Milano provided their Communication Network with another beautiful gathering, this time hosted at the lovely atmosphere of the Bio-Mediterrenean Cluster. As usual, this was a sensational opportunity to interact with all the professionals involved in the field of communication in the biggest event of 2015, in an attempt to create a space to interact, exchange ideas and bring about inspiration for content. Apart from the usual customary eating and drinking, the Expo team organized a pretty entertaining treasure hunt. Ten captains were named (I was sooooo honoured to be one of them :)) and respective teams. Every team had its own hashtag (in our case #teamlampedusa). A riddle was published on Twitter with a clue. If the team got the right answer, a second riddle was published and so on…until the final riddle. You know, community managers are quite competitive people. Always trying to get more followers than others, more likes, more engagement and obviously this treasure hunt could not have been more awesome. 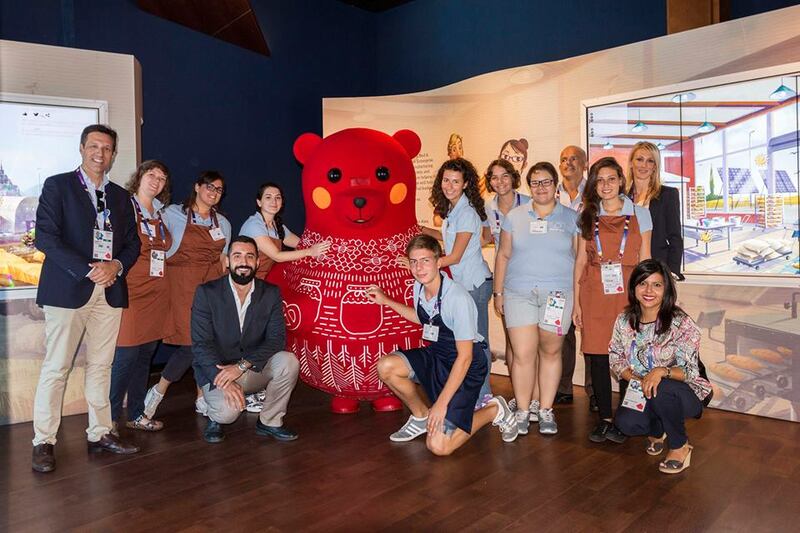 The communication team of the Russian pavilion is doing an outstanding job in promoting their activities, their brand and encourage people to visit them. Considering their followership and their visitors’ count, I guess their communication is totally working. Apart from the simple investment in communication outreach, their efforts in branding their presence at Expo displays some pretty unique features that definetely make them stand out from the crowd. This happens in an enviroment where already thousands of very capable communication professionals have gathered. Ergo, I take my hat off in front of this team’s terrific effort and results. Being innovative means being either unique or the first to do something. The Russian pavilion have done that with Russia Expo 2015 TV. which is a pretty awesome and effective idea. Often conducted by Masha, their TV is very interactive. It is not just broadcasting the activities of the pavilion but it engages with visitors, guests, VIPs and, most importantly with many other Expo stakeholders (Expo organizers, other pavilions and partners). This product does requires a bit of effort, a dedicated audiovisual expert… and a lot of personal touch but overall it is an absolutely great channel and the return on investment is pretty interesting. Keep it up! Always “sul pezzo” no matter what. You tag them – they react. You mention them – they react. You think of them – they think you back 🙂 This way of working on community management takes great dedication, but this seems not to have discouraged their super engaging, fun and informal attitude. For me, they are the best comms team and it’s beautiful to see it’s a team of only women. A true example of women in management. Keep up the good work! Apart from their digital work, their communication staff organizes lots of networking event in their beautiful terrace, which certainly help bridging digital with traditional networking activities. There are three more months to go and three more months to do amazing things! 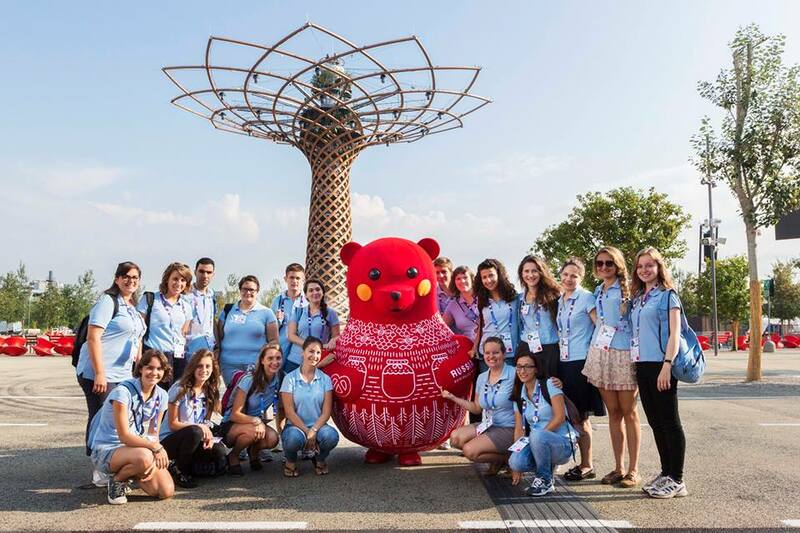 Last 20 May was a great day for me and for all the Community Managers working at Expo Milano 2015. I was invited to share my experience in live-covering Europe Day at a social media workshop in Expo. It was for an honour to hear Stefano’s words and I take my hat off in front of the guys of the Social Media Team at Expo. They are doing a terrific job not only in informing and engaging visitors at the biggest event of the year but they are creating a proper solid network of digital communication professionals. Bridging the gap between human and digital relations among people is the main purpose of social media. What I wanted to stress in my presentation was that, no matter how well you can get prepared for live-covering big events, you need to be able to change strategy promptly. Social media nowadays requires flexibility and a reactive mind. All that matters at the end of your event is the overall success and the bonding you create with your team mates. Yes, I say “team mates” because the work we do as community managers is very similar to what sports teams do when they prepare for a big game. All that matters at the end, after the game is over, is represented by the picture below. The more people digitalize their relations, the more people are surprised to physically get together or even receive a phone call. These regular gatherings, that the Expo team has been organizing, is a great example of what more and more networks of professionals should be doing both in the public and the private sector. Special thanks go to Mariella Merlino and Manuela Bonfiglio for making this network happen and to Giacomo Biraghi for his continuous effort in making people aware of the great opportunity that Expo Milano represents for Italy, Europe and the world. Expo Milano 2015: an outstanding opening of the European Union pavilion! Last 9 May I had one of the most amazing days of my professional life. We inaugurated the European Union pavilion at Expo Milano 2015. All the work we have done for months has paid off amazingly with an incredible turnout and very inspiring words from both President Martin Schulz and High Representative Federica Mogherini. “Europe is changing, flexibility is no longer a taboo and austerity is no longer a mantra” stated Mogherini. The High Representative also took the opportunity to thank all those who contributed to a big event like Expo Milano 2015, first and foremost the volunteers. After the ceremonial welcoming speech, Europe Day at Expo went on with the “Citizens’ Dialogue”, a debate between institutions and citizens that took place at the Expo Auditorium and welcomed thousands of citizens and high school students from across Europe. The lively debate moderated by RaiNews24 Director Monica Maggioni tackled some crucial topics for Europe such as nutrition and environmental sustainability. The discussion also grew online through social media, with the official hashtag #EUdialogues (mentioned over 2000 times in the day). At the end of the Dialogue I had the honour of jumping on stage and getting a quick post-event statement by both Mogherini and Shulz on the the interaction and communication opportunities offered by this type of event. I must say I was thrilled at the very least. The summit had the target of exploring strategies and exchange knowledge and best practice in the field of social media for public service media with the wider European Broadcasting Union network. It was an aspect of social media I hadn’t been involved in before. Hence, listening from the experience of TV and radio producers was really interesting and I hope I’ll get a chance sometimes to work in the same realm. Social media is now an integral part of public service broadcasting. Maximizing the use of social platforms has become key to making the case for public service media as it allows us to understand our audiences better and to be more relevant to them; to increase engagement and interactivity; to empower, curate and share stories and messages; and to become the most relevant source of information for our audiences. Bringing reporters, producers and presenters together was the ideal set to understand how radio, TV and paper need to reshape their content and their way of working by integrating social media in their overall communication plans. In particular, in the past few years, I have been witnessing the tendency, from social media professionals, to over-discern themselves, from communication managers. A significant part of the conference discussed how social media is reshaping journalism. A topic that Alex Volonté took a closer look at in his blog. The best story of the day was not about engagement or live-tweeting strategies. It was about how the digital presence of the Eurovision Song Contest came about. Believe it or not, it was (obviously) all because of a girl. Sietse Bakker, Eurovision Song Contest Event Supervisor, a loooooooooong time ago, wanted to impress this girl he liked. How, you ask? By making a website about the Eurovision. Long story short, he gets a job offer for that. Sure, there is more to that but this happened. This is an awesome success story and it really embraces a set of recommendations I always give to neo-graduates: “Jobs ain’t waiting for you. In this market you have to stand out of the crowd and go get those jobs by the horns.” Sietse (kind of) did that. If you have an awesome idea, smart businesses will see it. Sietse is a terrific guy (see the tweets below as a proof) and the people at EVN Social loved his approach. Plus, he manages probably the coolest cross-country TV event in Europe. I mean, how can you not like the chap? The reason why I need to talk about Alex Trickett, Head of sports at Twitter, is because Twitter Sports created some of the coolest social media analitycs-based charts I have seen during the 2014 Football World Cup in Brazil. More videos from the event will come soon. I’ll keep you posted for any update.